The Archipelago of Madeira is around 300 miles from the African coast and about 600 miles from the European continent, known to the Ancient Romans as the Purple Islands, were discovered by the Portuguese in the 15th Century. The archipelago is made up of the islands of Madeira, Porto Santo and the uninhabited islands of Selvagens and Desertas. A popular year-round resort, Madeira is visited every year by about one million tourists, noted for its Madeira wine, flowers, landscapes and embroidery artisans, as well for its annual New Year’s celebrations that feature the largest fireworks show in the world. The main harbor in Funchal is the leading Portuguese port in cruise liner dockings, being an important stopover for commercial and trans-Atlantic passenger cruises between Europe, the Caribbean and North America. The Islands have two airports, Funchal Airport on the Island of Madeira and the other in the island of Porto Santo. Flights to the islands are mostly made from Lisbon and Porto, but there are also direct flights just 3 to 4 hours from most European capitals. Transport between the two main islands is by plane or ferries, the latter also carrying vehicles; modern roads reach all points of interest on the islands. These volcanic islands, warmed by the influence of the Gulf Stream, enjoy warm comfortable summers and mild winters that make them an enchanting holiday destination all year round. Looking at the size of Madeira, one can hardly imagine that this archipelago has so much to offer. From many historical monuments, squares and streets enchanting gardens, picturesque villages, amazing landscapes, impressive volcanic caves, rugged coast lines, beautiful natural beaches and breathtaking views, there is so much to see that one visit to Madeira may note be enough! On the nearby island, the Porto Santo Golf Course has been designed by the legendary spanish golfer, Severiano Ballesteros. 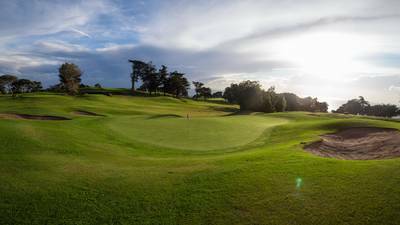 Whichever course you choose, you can look forward to spectacularly stunning views, exotic flowers and challenging courses suitable for players of all levels. If you feel like some relaxing golf holidays in beautiful surroundings with a mild climate and fine food and wines, then head for Madeira.